Never Do This to Your Coins! Coin collectors like to show off their coin collections to other collectors and friends. At the same time, it is possible that your actions and displays may be harming your coins. 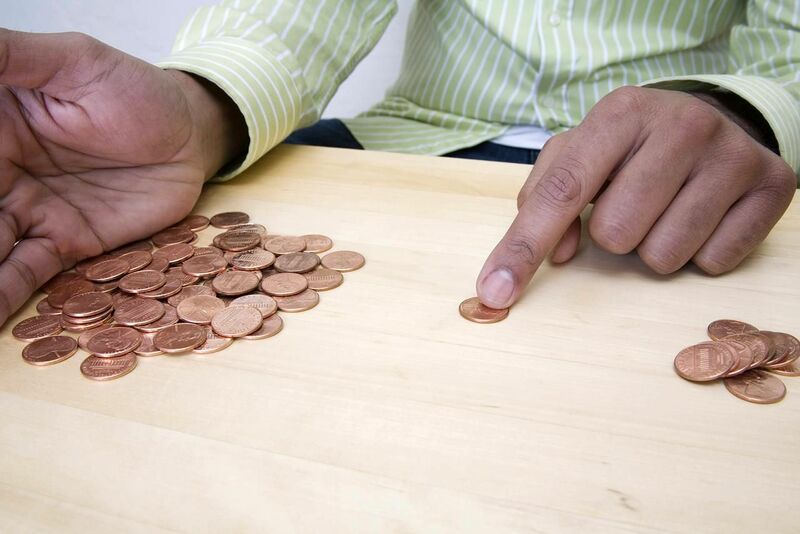 Here are seven ways that coin collectors can ruin their coins without even knowing it. I've even seen expert coin dealers spitting on their coins without even knowing it. If you want to protect the investment that you are making in your coin collection, then take the time to learn how to handle them properly, clean, store, and protect your valuable coins. Otherwise, your coin collection will be worth much less when you or your heirs go to sell them. Just touching your coins with your bare fingers may be enough to damage them. High-grade rare coins are especially susceptible to damage from the touch of your finger. It is possible that you will damage your coins if your fingers come in contact with mint state and Proof coins. Your fingers contain oils, acids, and minuscule pieces of grit that will adhere to the surface of the coins and cause them to discolor or suffer microscopic scratching. When you handle your coins, wear cotton, Nitrile, or latex gloves, and handle the coin only by the edges. It is also possible to damage your coins if you drop them on a hard surface. Therefore, hold your coins over a soft cloth or pad as you are working with them. As soon as you are finished, you should return them to a proper coin holder. Except for coins freshly dug-up out of the earth from a metal detecting find, cleaning or polishing your coins will do more harm than good. Once you expose metal to the air, it is natural for it to oxidize, or tone. If you strip the coin of this toning, not only will you lose any remaining mint luster, the coin will appear harsh, unappealing, and suffer microscopic abrasions that will lower the grade of the coin. Additionally, toned coins are worth more than coins that were stripped of their original toning. If you really must clean them, clean coins safely. 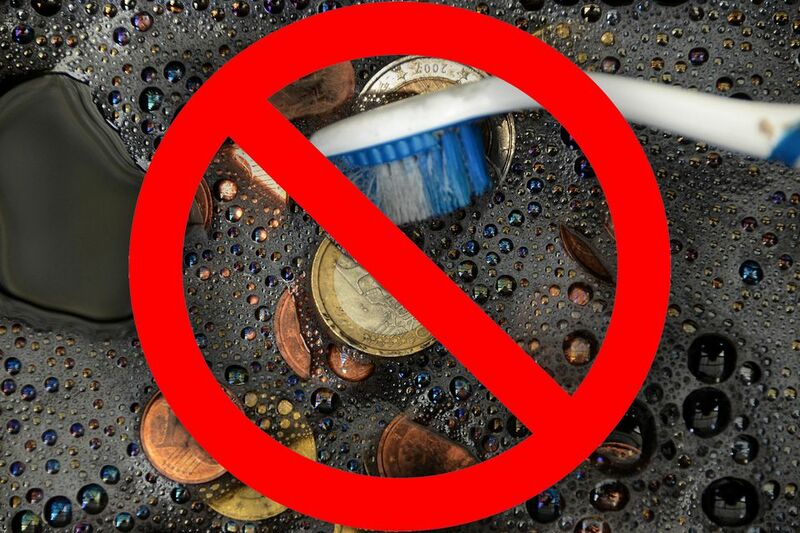 Talking about your coins can do just as much damage as touching them or cleaning them. If you leave your coins exposed while you chatter away little bits of saliva that escape from your mouth when you talk will land on your coins. These microscopic bits of saliva can cause spotting and discolorations that are difficult to remove. Collectors have ruined many uncirculated and mint-state coins this way. Say whatever you want about your coin collection, just make sure your coins are safe when you say it. You are certain to greatly decrease the value of your mint set, proof set, commemorative coins or encapsulated coins by removing them from the mint-issued holders they come in. The holders, along with the box and literature (if any) are part of the "set" and should be kept intact and pristine. Similarly, coins that have been slabbed by third-party grading service are worth a premium in their protective cases. Never remove coins from these types of permanent holders unless there is a specific reason that would justify the coin being cracked out of its slab. Storing your coins in paper envelopes with your notations beside the coins, or in cardboard boxes is a good way to damage them unless you are careful to use acid-free paper materials. Over time, the paper material breaks down, releasing acidic chemicals around your coins. This acid will cause spotting, discoloration, and can promote oxidation (toning) of your bright, mint surfaces. Be sure to buy only acid-free paper and cardboard supplies to store your coin collection. Another good way to cause spotting and degraded the surface of your coins is to store your coins in PVC-based plastic flips, holders, and boxes. Similar to the way the acid in the paper can harm your coins, the chemical by-product of certain plastics can damage your coins over time. If you store coins in those handy food-grade plastic containers, or soft, pliable coin flips, your coins will eventually develop a slimy green coating on their surfaces which will damage them permanently. If you store your coins in the attic or basement, you are probably exposing them to extremes of temperature and humidity that will promote their oxidation. Also, these conditions will quickly break down the storage materials (such as flips, paper envelopes, cardboard holders, plastic containers, etc.) that hold your coins. To protect your coin collection, it is best to store it in a dark, dry, temperature-controlled environment such as a safe deposit box or specialized coin cabinet.